In Astrology Jupiter is benevolent and lucky for everyone. In Astrology Jupiter is there for What? In Astrology Jupiter is the great benevolent ruler in the solar system, even when it's afflicted, it's not so bad. As for the Greeks, they named Jupiter after theirs too; Zeus, but happily our astrology planet Jupiter doesn't have the qualities in common with dreadful Zeus. Jupiter takes 12 yrs. to round the zodiac. Although Sagittarius is governed by Jupiter and being that is so they almost always walk with luck, this loving planet shares its luck with every sign of the zodiac through the years, each getting one year of bonus Jupiter luck. Jupiter’s glyph is the half a circle over a cross, meaning the soul prevails of over matter. Jupiter's purpose is to elevate our consciousness past the tangible world. Jupiter promotes in us the impulse to achieve, flourish, and amend ourselves. In Astrology Jupiter signifies the urge to find the higher meaning in a situation, Jupiter is philosophic. When one feels the longing for expanded education no matter if it's in a conventional school or not, that's what Jupiter is. Jupiter conveys where you feel surefooted and in command. Jupiter is the planet of expansion. Jupiter is all-encompassing and opens your horizons. This planet also provokes a longing to do more with our lives, see the world and visit for exotic places. This applies to all experiences in life, from gaining weight to deriving cosmic bliss, to transcending personal consciousness. Jupiter imparts promise, spiritualism, and sympathy. By and by, Pisces was said to be ruled by Jupiter at one time, so let’s go with that. Jupiter co-rules Pisces and the 12th House, and so here divulges how you pull in good karma from the grace you show to others. It also depicts if you are a philanthropic and sympathetic person. Modern astrology says; Jupiter is no longer co-ruler of Pisces, they place Pisces in the sole ruler ship of Neptune. I think that life bears the witness that the antiquated custom still rings true. Having said this about Pisces, Sagittarius remains the one with the force of Jupiter. In Astrology Jupiter is the planet of chance, good luck, and undeserved opportunities. Jupiter builds everything it affects. At its most benevolent Jupiter shows unselfishness and amiability. Jupiter corresponds to the inspiration to grow in feelings (deeper and stronger), develop our minds and to receive spiritual enlightenment. Jupiter also governs riches and gifts. Jupiter governs the practice of medicine, morality and value-systems, politics, doctrine, community service, altruism, and faith. Jupiter is the "Almighty Truth" is frequently connected to laws. Jupiter’s placement in your chart shows; how extroverted and kind you are, whether you attract money and possessions, in addition to what jobs you'll have the most luck in. In Astrology Jupiter dominates in the charts of multimillionaires and Billionaires. It tells of where you could be an example to others whereby they could learn from you. Jupiter is also noticeably important in the horoscopes of Philosophers, Comics, Occultists, and those who have an overwhelming desire to travel. If you have your Sun, rising sign and/or your Moon in Sagittarius then information on Jupiter is crucial to you. With a Sun in Sagittarius, Jupiter will give details of where you will find and the best way to reach your destiny. With a Moon in Sagittarius, Jupiter indicates where you'll feel satisfied. With a rising sign in Sagittarius, Jupiter will describe where you can be yourself as you ache to do and be able to affect your surroundings. You will find that the House where Jupiter lives in your chart contains the subject(s) or situations in which you receive assistance from others and where the planets seems to align to help you out. Additionally, Jupiter imparts dedication, discernment, trust, assurance, imagination, fairness and optimistic feeling to a chart. Your Jupiter sign will show where you can expect to profit financially. Your Jupiter sign will show where you mostly feel lucky. Since Jupiter extends or produces good luck in the place that it's located in a chart. Your Jupiter zodiac sign position expresses what you find worthy, values. Jupiter is acknowledged as the giver of fortune. Jupiter controls the good things that come to you easily and with little effort. You could find that Jupiter always bails you out in the nick of time. At its best, Jupiter denotes exuberance, a solid spirituality, love of knowledge, the highest wisdom and human reason, and the kind of joy that only comes from the inside. 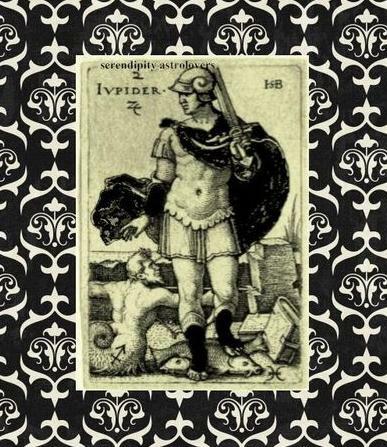 At its worst, Jupiter imparts; laziness, overstatement/exaggeration, squander, frivolity, and living a life of excess.